Engaging Learning Practices and Higher Levels of Thinking! Engaging and engaging learning practices and higher levels of thinking should be at the core, the driving force, behind our daily lessons. Let’s face it, a lot of work is involved in making that happen. Set aside any negatives you may have about common core – at the foundation – the expectation is that students master concepts, feel success through critical thinking, and can strategize effectively. These are tools we need in everyday life. I’m all for it. I’m pretty happy about the whole college and career readiness push. The career part is what makes me happy. We’ve been focusing a lot on those kiddos heading off to college quite a bit. So many others have been left behind. They are behind and lacking critical thinking skills. That’s not a great mix. For quite a while I was bothered by the whole gifted program. We call it GATE around here. The desire to foster critical, deep thinkers has always been a cornerstone in gifted student programs. It’s bothered me that it has been something that is restricted to only those students labeled GATE. I have always tried to ensure that this concept has been blankets the entire sea of students, regardless of the acronym (or lack thereof) attached to their name. All kiddos can and should engage with critical, deep thinking tools. The MPS (mathematical practice standards) that cropped up with common core, are learning practices that are vital to all thinking and learning in all content areas. There are 3 fantastic ways to help students *think* and truly invest in the concepts to build schema and attain mastery. One of the primary tools we use in class is cross-curricular learning practices. Many of the concepts show up in the math standards practices and GATE depth and complexity icons. There is no reason to limit thinking skills to one area of curriculum. The more the kiddos use them, the more competent they’ll be with them. We use these strategies all day in all subjects. I have these in clear view on my white board all year so we can refer to them when we are trying to figure something out. We discuss critical thinking and thinking with a STRONG brain. I put business card magnets (afflink) on the back of them so I can take them down and move them wherever I need to if we need to get.a.point.across. I like using the smaller versions of these cards on a ring for quick reference. 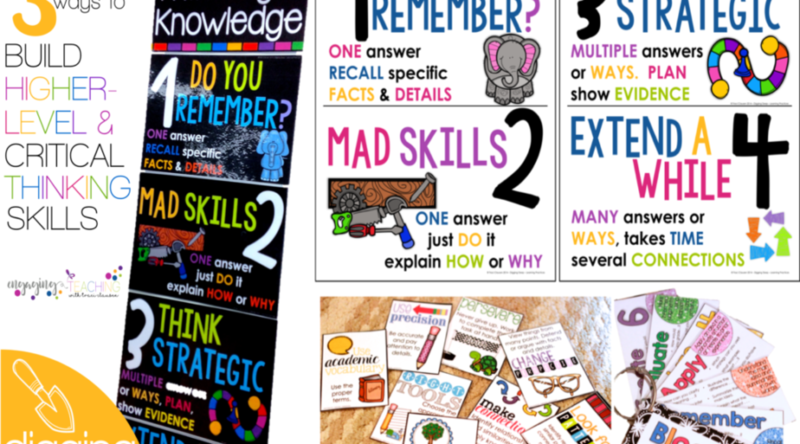 I have these little posters coupled with depth of knowledge posters. My kiddos quickly learn to expect that I am going to ask them why, or ask them to demonstrate, or show me, or build it with your partner. I tell them we need to dig deeper and think higher. My classroom decor is light and bright – so this version works best there. But I also made the cards in black. I LOVE how everything POPS on them. Instilling high expectations for thinking in your kiddos does so much for them. The thrill they get from figuring out a difficult concept… that lightbulb moment… is exhilarating and addictive. They will want to work for that again and again. Students take so much pride in what they are able to accomplish. Encouragement to reach another level is often all it takes. I also love the update to Bloom’s Taxonomy. The *newer* order makes a lot more sense and is easier to incorporate. I use little cards as a quick reference to help me come up with questions and activities that will help the kiddos engage those higher orders of thinking. Use these questions to help build lessons, take discussions farther, inspire topic journaling. Those Bloom Quick Cards are FAN FAVORITE! Just click to get your copy! EDIT: BONUS file has been added to this resource! This one includes the same cards, but with a slightly different look – in line with my vanilla sherbet theme in my classroom. Don’t forget to grab your Bloom’s Quick Cards! How do you download the quick cards? They look adorable but I can't figure out how to get them. They are under the "Exclusive Fan Freebies" tab on my FB page. You have to be on your computer to see that tab on FB. Their mobile apps don't allow you to see tabs. I don't see them, either. I'm trying from my computer. I was wondering if there is a way to download the fan freebie "Blooms Quick Cards" without Facebook? I don't have facebook. Thank you so much!! I love the Bloom's Quick Cards! Your products are beautiful. You're welcome and thank you, Wendy! I am so frustrated, I have tried several different ways to get your Bloom’s Quick Cards. Because of all of Facebook’s changes, the only way you can see the FREE files is if you are on a computer. The link to FAN FREEBIES is on the left side of my page. You will want to click on the file Digging Deep Freebie. Those cards are part of my Digging Deep resource on TpT. Tracie, I have not tied it yet. But thank you, can’t wait! I can’t get the facebook link to open…it says the page doesn’t exist.